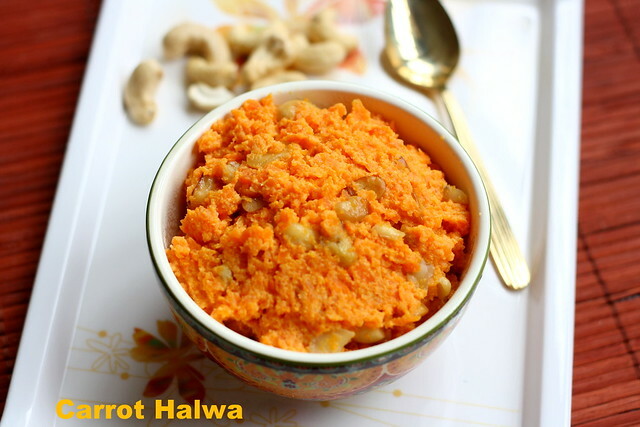 Carrot halwa | Gajar halwa recipe, a popular Indian sweet, made using Carrot, milk and sugar. 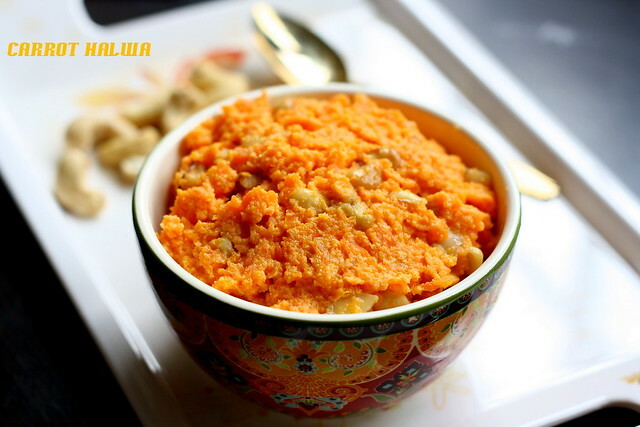 Many people make carrot halwa using Khoya, to enhance the richness. Some people make carrot halwa with condensed milk by replacing sugar with condensed milk. I have tried this few times when i had guests at home. I am yet to try Gajar halwa with khoya. This time we have a reason to make a sweet. since the entire family is a so happy as my brother-in-law got married last week. Let's see how to make gajar ka halwa. 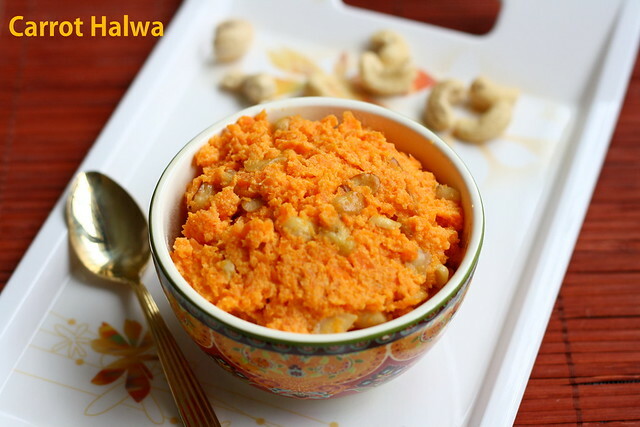 UPDATE: SCROLL DOWN TO SEE THE ALTERNATE EASY METHOD OF MAKING CARROT HALWA. Check out my beetroot halwa recipe. Grate the carrots in a grater which has medium sized holes. In a heavy bottomed pan, add the grated carrots and milk. Boil it in a medium flame stirring in between. Boil till the carrots are cooked and all the milk get absorbed. Add sugar at this stage and stir well. Add the milk masala. If not you can add cardamom powder. Switch off the flame and golden fry the nuts in ghee. Add to the carrot halwa. If you are using condensed milk, add at the final stage and stir till the mixture gets thicken. Peel the skin of the carrots and wash them . Chop them roughly into pieces. Pulse this in a mixer.Add milk to this and pressure cook this for 2 whistles. Once done, add the cooked mixture to a pan and ad condensed milk. Boil till the rest of the milk gets absorbed. This will take 10 minutes approximately. I served with vanilla ice cream, since we all love this combo a lot. For 2 cups of grated carrots, we will get 1 and 1/2 cups of halwa. You can keep Gajar ka halwa the fridge and can consume within 2 days from the day of preparation. Its been ages since I made/had this!With ice cream? sounds good! Have to try out the combo! So drop in at my blog sometime. delicious halwa!! nice combo with icecream.. Delicious halwa dear. My mouth is watering here. Hope you have settled down in ur new house. Hope u will invite us to ur newhouse and serve halwa and icecream.I am drooling here. Thanks for ur comments friends, suhaina ur most welcome anytime. yummy-my all-time favorite, especially with vanilla ice cream. Vannila icecream and carrot halwa- a lovely combo! Yummy Halwa Jeyashri,Wounderful colour too.Luks gr8. I have not tried this combination before but love carrot halwa. Loos so yummy halwa..Nice combo too. i love carrot halwa with ice cream. yummy halwa. Welcome back jeyashri.Comforting n a decadent dessert to celebrate with jeyashri.Love carrot halwa for its deliciousness.Happy that u r back. Carrot halwa looks perfect dear who says noo to sweet halwa my faaav simple sweet. well presented the halwa dear. Carrot halwa with vanilla icecream is a favorite combination in our home too, the halwa looks fabulous! looks rich n yummy...the combo with vanila icecream looks awesome n colorful. For 2 cups of grated carrot 3 tbsp sugar is enough?